The Lexmark MS810DTN is a small monochrome laser printer built for heavy duty printing. The network-ready Lexmark MS810DTN laser printer can deliver 250,000 pages per month and offers high paper handling capacity. This device also comes with a built-in duplexer and offers a maximum resolution of 1,200 x 1,200 dpi for texts and 2,400 dpi for images. 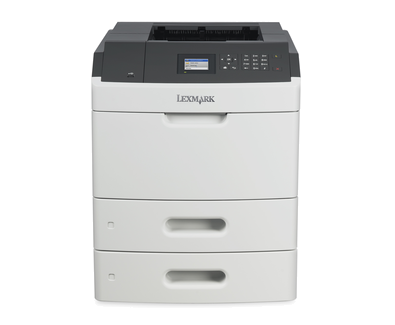 The Lexmark MS810DTN printer is integrated with an 800 MHz dual core processor and standard 512 MB of memory. Wireless connectivity is not built-in. The Lexmark MS810DTN mono laser printer measures 20.7 x 16.7 x 20.1 inches and weighs 65 lbs. it can handle a standard of 1,200 pages that can be upgraded to 4,400 sheets. For connectivity, Ethernet and USB ports are available. The Lexmark MS810DTN black and white laser printer has a print speed of 55 ppm for monochrome output on simplex mode. Optional finishers are also available. This device comes with a 24 inch LCD display on is control panel. Users don't have to wait long to get their output. Aside from being fast, the reliable Lexmark MS810DTN workgroup printer also offers high-quality output. With the built-in Ethernet, workgroups can easily share this device. The Lexmark MS-810DTN monochrome printer is easy to use and setup. It can save time as it has high-paper handling capacity and an automatic duplexer to cut back on paper waste. For quick printing, a USB host is available. Return program high capacity Lexmark MS810DTN toners work in this device to increase productivity and reduce the cost-per-print. The LCD display is a bit small and could be larger. The MS 810DTN printer is already expensive as it is and yet the wireless LAN connectivity and finishers must be bought separately.